This collection of Ramayana Teachings is mainly from books and the holy epic Ramayan. The teachings have been collected over a period of 10 years from books, magazines and newspapers. This page is an attempt to collect 108 teachings from the Ramayana. Anger destroys the best virtues, so keep calm. The desire to possess is at the root of all anxieties. Devotion is not difficult. All it needs is simplicity and contentment. Even the minds of those who follow no other path but that of Dharma, who have been taught all the rules of conduct, even they are very rarely happy at the sight of the good fortune which has befallen others. The mind of man is very unsteady. A fool thinks that wealth is the only way to happiness. When knowledge dawns, all earthly sorrows appear as hallucinations. The mighty army of Maya pervades the world. Her generals are lust and other kindred evils; her warriors are pride, hypocrisy and heresy. Peace and prosperity come without asking to the virtuous. There is nothing in the world difficult to secure for those who from their hearts desire the good of others. In this world there are three kinds of men. One man talks and does nothing; another man talks and acts; the third acts and says nothing. Ignorance causes you to succumb to the effects of worldly sorrows. Only contentment can destroy the seething cauldron of desires. Nature cannot be altered. Therefore, the wicked nature cannot be set right by an example or precept. Prosperity does not reside long in the abode of the wicked. Discharge of one’s duties without desire of outcome is the means of attaining the goal. Truth, charity, penance, detachment, friendliness, purity, straight forwardness, knowledge and the service to his preceptors are the real characteristics of Sri Ram. When there is no ego, there is no suffering. Lust is like a huge tree covered by the creepers of desire. Those that have devotion towards me will get knowledge and renunciation and they will attain to liberation from the round of births and deaths. Those who take shelter under me in this world, meditating on me and repeating the mantra of my sacred name, will surely get my vision, even unasked, as I know they have no other refuge. As a result of the spiritual disciplines you have undergone, you are even now liberated from all worldly desires. After your death, you will attain union with me. Just as, even people possessing eyes, cannot see things clearly in the night, but they can see their steps well when a light is brought, so also in those having devotion towards me, the self becomes self-effulgent. The rain has washed everything clean; there is no trace of dust to be found anywhere. This is how anger, when it surfaces, drives away dharma, making one incapable to differentiate between the right and the wrong. The earth is decked with rich crops, even as a generous and charitable person is endowed with riches that will benefit everyone. Wealth does not adorn a person who is miserly and refuses to part with even a penny to help others. Green grass grows and covers the path just like proud people who cover the path shown by the scriptures. They insist on their own opinions and disregard the words of wisdom of holy books. We must follow the scriptures and not get misled by futile words. Fireflies gleam in the thick darkness of the night like hypocrites. The difference between the light of the fireflies and that of the sun is that the light of the fireflies merely illuminates their own presence, whereas the light of the sun illuminates everything. The fireflies vanish in the light of the sun; their glory is only in the dark. Similarly, in the presence of saints and great men, the hypocrites fade away into nothing; they shine only in the company of ignorant people. A clever farmer weeds his fields carefully to avoid damage to his crops, just as a wise man avoids infatuation, vanity and pride. The goose is not seen anywhere around, just as righteousness is rare to be seen in Kalyug. Demon Kalanemi was deputed by Ravan to obstruct Hanuman who was on his way to bring Mrita Sanjeevani (medicinal herbs to rescue Lakshman.) Kalanemi had difference of opinion with Ravana but he obeyed him. 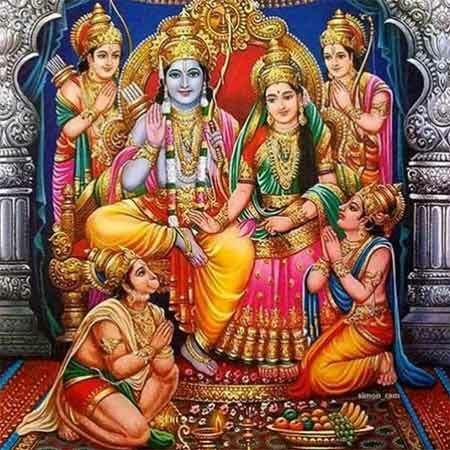 Before leaving he advices Ravana and asks him to release Mata Sita and take refuge in Sri Ram. ...morning bathed in pure water, and performed the morning Sandhya and other duties, sitting in a lonely place in an easy posture, having renounced all belongings, all attachments and all objects of sense, which are outside thee, do thou gradually draw inside thy senses, which are roaming outside. Do thou then always reflect upon thyself as distinct from the Prakriti. All this world, mobile and immobile, the body, the intellect and the rest, from Brahma to a blade of grass all that is seen or heard, is called Prakriti. It is also designated Maya. It is the cause of the creation, preservation and destruction of the tree of the world. It always creates Sattva, Rajas and Tamas. Desire, anger and the rest of sons of Maya, injuring others, thirst after objects of sense are its daughters. Thus day and night Maya deludes the self who is all pervading. Having for its principle the notion of ‘I am the actor’ and the enjoyer, and super imposed upon the the self and brought him under her sway, with her attributes she always plays with him. When a person is awakened by a preceptor who has become the very self of wisdom, i.e., who has realized his own self as the self of all, then having turned his eye inwards, he ever sees the self clearly. Thus the embodied self becomes emancipate in life and is freed from the attributes of Prakriti. Do thou also ever reflect watchfully over thy own self, having brought thy senses under control. Knowing thy own self to be other than Prakriti, thou shalt be released. If thou art incapable of engaging in meditation, do thou take refuge under god with attributes. Kalanemi’s Advice to Ravana is not found in Valmiki Ramayan but is part of other regional versions.